This years Christie's annual sale of International Motor Cars at the Monterey Jet Center featured sixty cars from celebrated marques, classis automobiles, and even a few that had ties to celebrity ownerships. Total expected sales was around 7.5 million, with the actual sale tally reaching $8,197,057. It was a sale of 'Exceptional Motor Cars' with many of the cars that crossed the auction block filling those high expectations. Not every car was exceptional though, and added a unique flavor throughout the auction, as some of the cars had been restored to very high standards, while others were in need of repair, and even a handful being in very poor shape. What the auctioneers hoped was that bidders would see past the rust, dust, dents, and torn upholstery to the potential the vehicle possessed. The lowest automotive sale of the day was a 1953 Buick Skylark that appeared to be pulled straight out of a long hibernation in a barn somewhere. It was estimated to sell between $10,000 - $20,000. Bidding surpassed those figures, settling at $20,900 including buyer's premium. What had inspired bidding was the car that rolled onto the stage just prior to this car. It too was a 1953 Buick Roadmaster, but it was in great condition and carried an estimated value of $120,000 - $170,000. The car that carried the most anticipation and excitement was the Ferrari 250 GT Lusso once owned, driven and raced by the legendary Steve McQueen. It was estimated to fetch between $800,000 - $1,200,000. 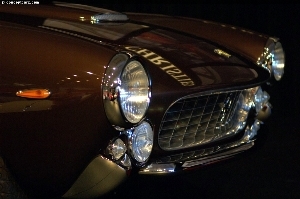 Only 350 examples of the 250 GT Lusso were ever constructed with only a handful finished in the rare color of Maroon metallic with a light beige interior. These were luxurious sports cars built on a short wheelbase and powered by a potent Colombo V12 engine capable of producing up to 250 horsepower. The final sale price for this brilliant automobile far exceeded expectations, selling for $2.31 million. Another high sale of the day was the Duesenberg Model J with coachwork by LeBaron, estimated to sell for as high as $850,000. Bidding surpassed that estimate, settling at $902,000 including buyer's premium. It is in excellent condition, one of the few Convertible Berline's created, and a rare LeBaron bodied Duesenberg. The Napier Type 23A, excepted to sell as high as $500,000, sold for $682,000. It was among the more rare vehicles at the auction, and created from a marque that had a short, yet distinguished, lifespan. It resided in the car of Rod Blood, the President of the Veteran Motor Car Club of America from 1942 through 1944. Included in the category of 'rare' was the 1924 Lancia Lambda. It was in unrestored condition, estimated to sell for just under $100,000, and was part of the same stable since the 1940s. The Lambda's were produced from 1922 through 1931 and incorporated many designs and construction methods that were ahead of their time. The design of the vehicles were inspired by the load-bearing principles of the hull of a ship. The vehicles strength came from the driveshaft tunnel which formed the backbone of the car, meaning a heavy frame was not needed. Within a few years, Lancia was making the claim to have 'The Best Medium Powered Car in the World.' They backed up this claim by entering in the grueling Mille Miglia race, where their efforts were rewarded with top ten finishes. At auction, the Lambda found a buyer willing to part with $104,500, including buyer's premium, to own the vehicle. The first seventeen vehicles offered for sale were from a private European Collection and offered without reserve. These vehicles accounted for the bulk of the auctions 'Without Reserve' designation, and all were sold. The collection included several Corvettes, all were in good condition but had been part of static display and seen little use throughout the past twenty years. So their true mechanical condition was not fully known. The highest sale from this collection went to the 1936 Packard Twelve. It is a very, unique vehicle and had many aficionado's asking, 'What is it?' It carries Packard emblems and sits on a Packard chassis and running gear, but it is an Art-Deco themed car in the style of an Auburn 852. It has a boattail speedster body, finished in black and turquoise livery, with teardrop style fenders. A gorgeous car with a slight identity crisis, expected to sell for for $200,000 - $400,000. As the gavel fell for the final time, the car had been sold for $346,500 including buyer's premium. Total vehicle sales for the day were $7.86 million with the average sale being nearly $200,000. There was a fairly good sales rate of about 70% finding new ownership and about 12 being sold above the estimated value. The sale was held during the annual Pebble Beach Concours d'Elegance weekend and Monterey Historic Races. There were viewing days prior to the auction, and a cocktail party where the auction, automobiles, and aircraft are the theme of the event. Vehicles and jets from private collections add to the display. This year there were around seven or eight private and corporate jets for sale, plus competition cars including F1 and Indy racing machines, drag cars, and more. Other cars setting the ambiance were a Callaway C16 Speedster, Hennessey Viper, Bugatti Veyrons, and a Ferrari F40. Christie's has been performing auctions devoted solely to motor cars since the very early 1970s and is the longest continuous name in the collectors' car market. Using the description 'Exception Motorcars' as the theme for their auction depicts their mantra of quality over quantity.